The ideal gift for inquisitive little ones, this entertaining book retells eight favourite Bible stories, enhanced with over 60 lift-and-see flaps. Children will love exploring the stories as they lift the flaps along the way! 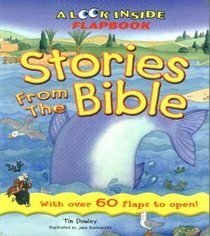 About "Look Inside Flapbook: Stories From the Bible (Vol 1)"
Delightful illustrations and easy to read text bring these much loved Bibletories to life. With lots of flaps to open, children should enjoyiscovering the many surprises, as they take part in each story.